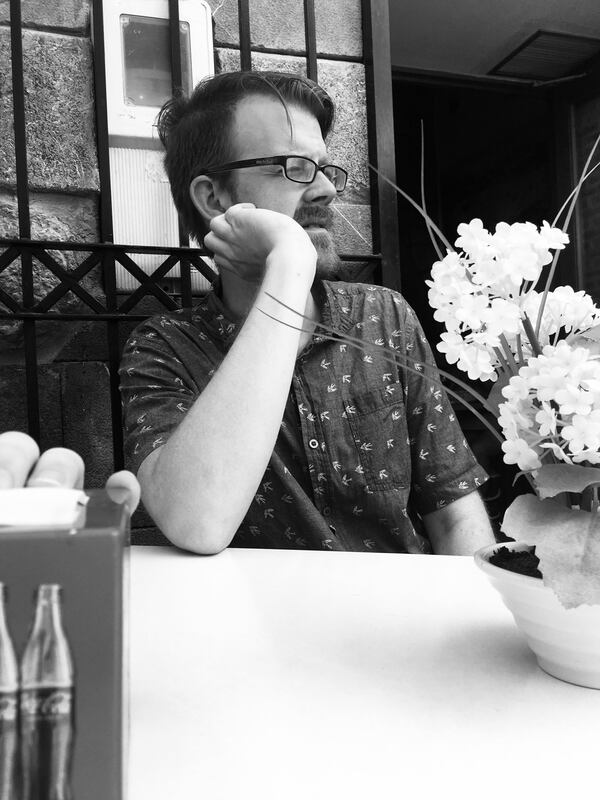 This summer, I have been taking a long hard look at assessment. While as students (and now teachers) we tend to few assessments as a “necessary evil”, this summer has changed my thinking on this. You can read more about the evolution of my views on assessment in this post. Throughout my reexamination of assessment, I have been thinking a lot about one that I have given hundreds of times: a reading benchmark assessment. The purpose of this assessment is to give teachers a baseline reading level for incoming students so that they can assign appropriate books, for reading groups based on ability, and identify students who may be in need of intervention services. While this data is incredibly useful, the current method for obtaining it is very labor intensive, relying on one-to-one oral reading assessments. This means that a classroom teacher, or in my case, an intervention teacher has to sit and keep a running tab of what the student is reading. This process can take 15-20 minutes per student. For more on these types of reading assessments, read my earlier post. In addition to high time costs of such assessments, there is even some question as to whether reading aloud is an effective measure of reading skill. Specifically, this type of assessment, with its emphasis on oral fluency, seriously disadvantages non-native English speakers and students with speech challenges. Additionally, the standardized reading tests that students (and teachers and schools) are evaluated with do not include read aloud questions. Not to mention that the current benchmark assessment does not even attempt to draw on students interests, environment, and intrinsic motivation. I set out to create a set of assessments that could effectively and efficiently give teachers a student’s reading level, and could also give the student an opportunity to share their feelings about reading with their teacher. 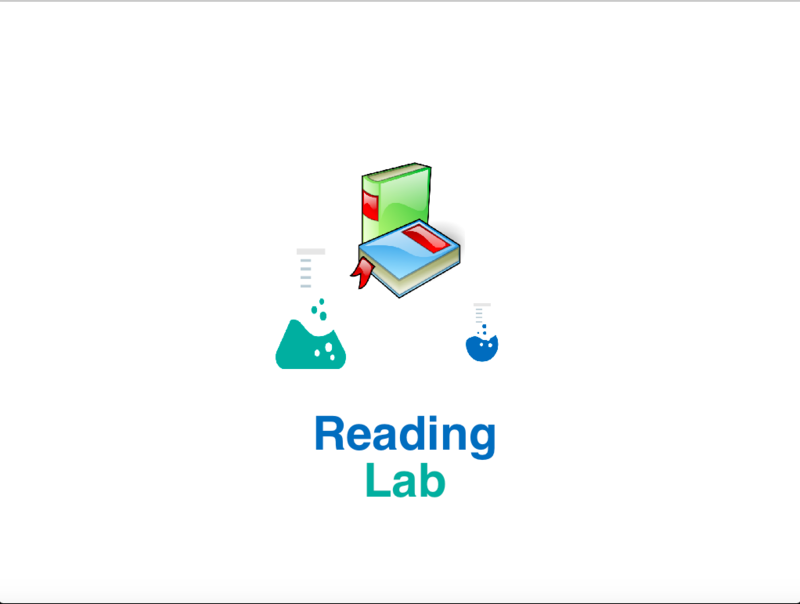 The Reading Lab, a computer-based application that tests students decoding skills and gives teachers and students an instructional and read-to-self reading level. 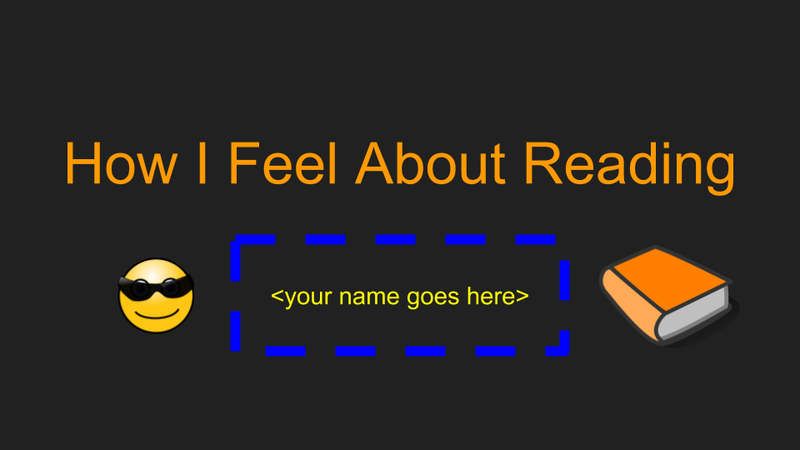 How I Feel about Reading, a Google Slides presentation that students can customize to reflect their own thoughts and feelings about reading. The two sections are separated and need not be given at the same time. The Reading Lab is an application that can run on Mac, Windows, or Linux operating systems. It features two types of reading assessment: word decoding and a maze reader comprehension test. When the application opens, students sign in and select an avatar (icon). These two elements are put together to form an ID badge that stays at the top of the screen throughout the assessment. I thought this was an important feature to include since it would allow students to personalize their assessment and really feel like it was just for them. The decoding section is designed to identify the students instructional reading level. This is the level at which the student can read and comprehend text with help. To find the instructional level students are taken through a progressive series of reading levels. The student continues to advance until they score lower than 90% on a given level. Stem Audio – a word is read to the user and the user must choose the correct word from four options. 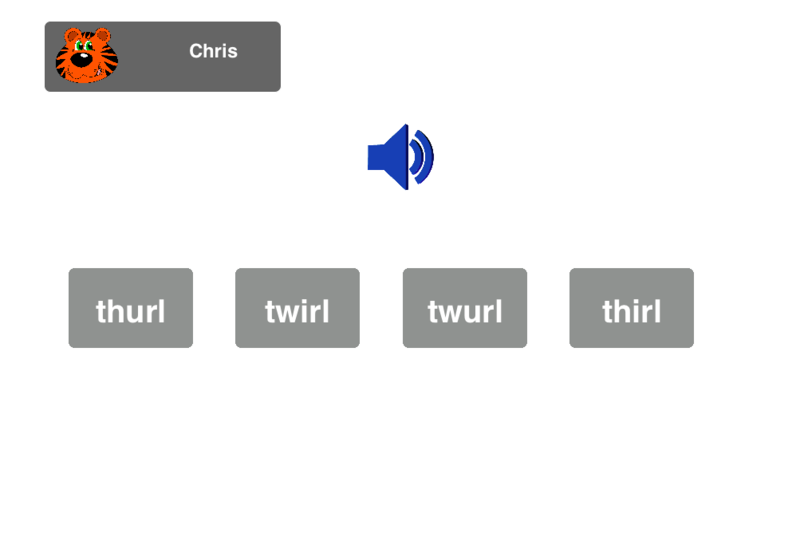 Note: in the example, the spelling ‘twurl’ is incorrect but is phonically reasonable, as a result, if a user chooses this option they will receive partial credit. Option Audio – A word is printed at the top of the screen. 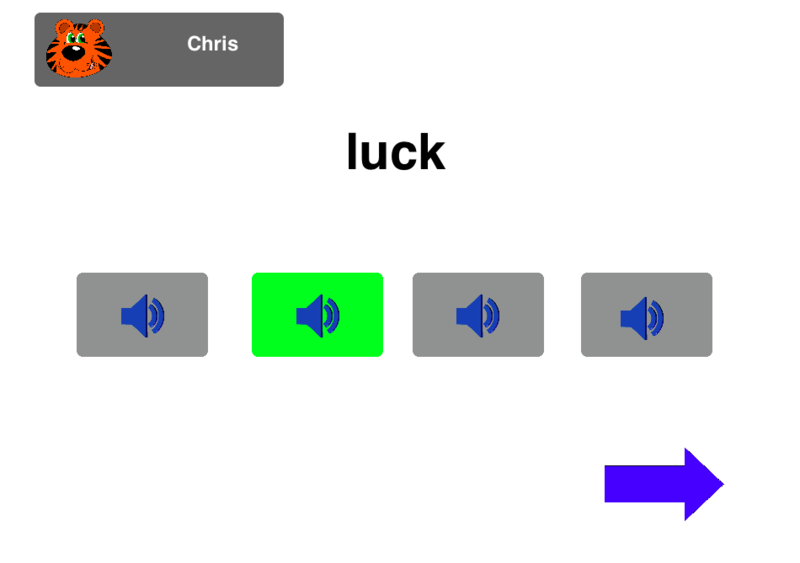 The user then listens to four audio options and clicks the one that matches the printed word. 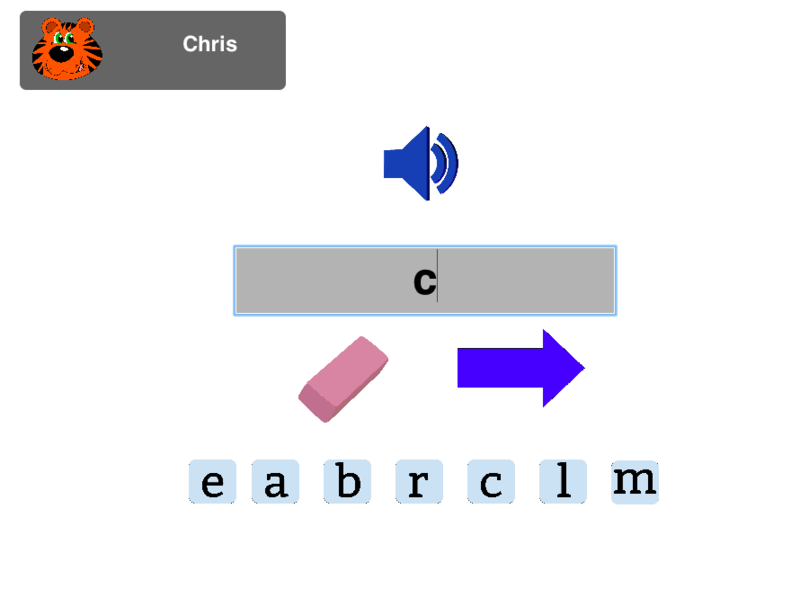 Stem Audio with Spelling – A word is presented aurally for the user. The user then uses letter tiles to spell the word in a field that is provided. The decoding section features twelve words per reading level. If the user scores a 90% or better on the twelve words they are passed up to the next level. So if a user was working in level E and passed with a 95.8%, they would be moved to level F. If the score is lower than 90% their score is recorded. This score and the reading level will be shared with the teacher to indicate the student’s instructional reading level. The student then proceeds to the maze reader comprehension section. A maze reader comprehension assessment consists of a passage of text in which one in seven words is left blank and students must choose three potential options to complete the text. The assumption is that “capable readers understand the syntax of what they read and the meanings of the words as they are used in the text. Some students with reading difficulties can’t comprehend what they read well enough to choose words based on semantic and syntactic accuracy” (Milone 2008, p. 150). 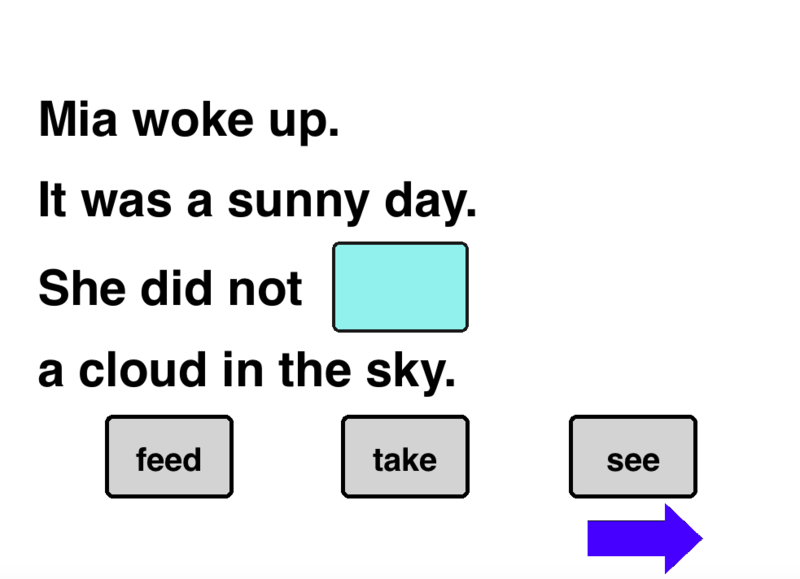 In this way, the maze reader can give the teacher a clear indication that the student is in fact able to read-to-self for comprehension at the given level. This is an important point, since often students can decode words at a higher level than they can effectively comprehend text. Here is how the maze reader comprehension assessment appears in The Reading Lab. An introductory example is provided with audio instructions. 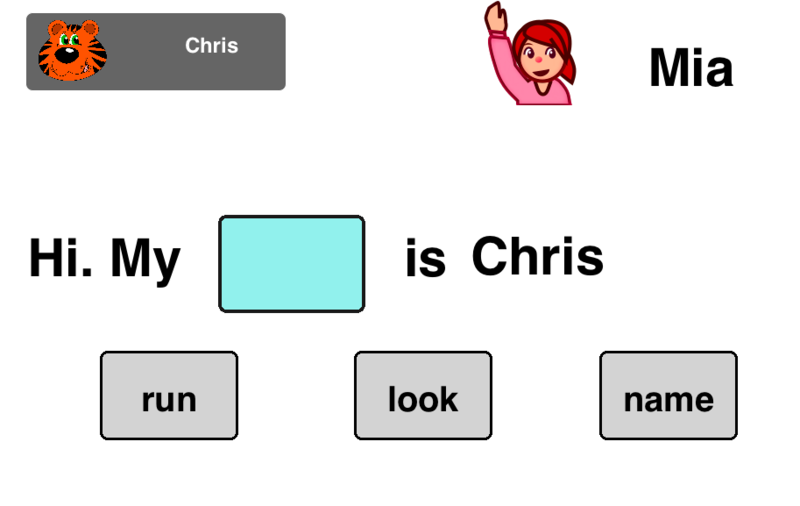 The user is introduced to any characters with proper nouns that will be in the passage (in this case Mia). They are then given a practice example where they are asked to complete the passage “Hi. My [name] is <the given users name>.” By using the user’s name, a more personalized experience is created. Once the user has completed the introductory example, they then begin the assessment. The passage runs 150-200 words depending on the level. After the first sentence, there is a word to fill in approximately every seven words. Upon completion, the user’s score is calculated, If the user scores 95% or better, it is safe to assume that this is a suitable read-to-self level. The level of maze reader that the student is assessed with is taken from the users decoding level. 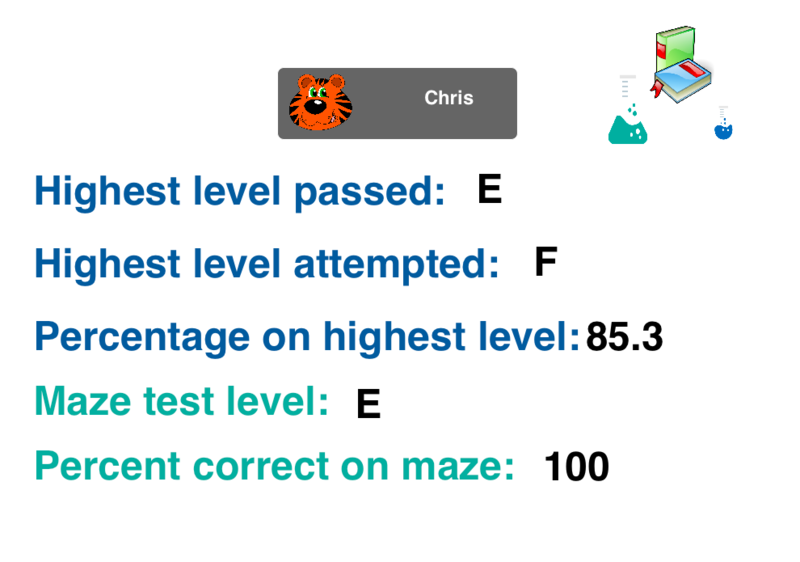 In the example of the user who passed the level E assessment, but only scored an 85.8% on the level F assessment, the user would be given the level E maze reader in order to confirm that they had sufficient comprehension at their read-to-self level. The final screen of the application shows students and teachers the students results. This screen can be password protected so that a password must be entered in order to see the results. This is done so that the teacher can discuss the results with the student, this should not be used to conceal the results from the student. It is important that students be recruited into the process of developing their reading, and I firmly believe that giving students clear feedback on their performance is an essential part of fostering student autonomy and intrinsic motivation. Results are presented as the highest decoding level passed, highest decoding level attempted, percentage correct at highest level attempted, maze reader attempted, and percentage correct on maze reader. This highest level attempted in decoding represents the students instructional level. This can be used for the student’s individual goal setting and to inform the teacher of the level of reading skills that are reasonable to expect from this student at this time. The maze reader data can be used to help students select books that are at a level which the student can comprehend. This information can also be used by the teacher for assigning reading materials and grouping students of like ability into reading groups. While the Reading Lab assessment is not robust enough to be used as a comprehensive form of intervention assessment, it serves as a useful indicator of students who may need additional diagnostic and intervention services. How am I going? How far is the student from having their instructional level betheir read-to-self level? Where to next? By going over this data with the teacher, the teacher is able to recommend a regime of just right books that will push the reader to the next level. While the goal of the first prong of the assessment was to help students get reading material that was at the right level for them, the goal of the second prong is to get to know about them as readers and get them excited about reading in the upcoming school year. For this assessment, the student works in a Google slide presentation that they share with their teacher. Instructions on how to copy the assessment and work in it are provided in this Youtube video. By using a Google slideshow, students have a fun and interactive way to create their own reading profile and share it with their families, friends, and teachers. Also, this file can be saved and updated throughout the year and serve as a reflective journal of their habits and attitudes toward reading. In addition to getting valuable information on the types of books that could hook the student, the teacher gets some exposure to the reading community that is around the student. This type of information can be very valuable for the teacher. Is there a family member that the student likes sharing books with? Does the student have negative associations towards reading? Does the student have habits that will support their growth in reading? All of this information can be very useful in crafting a pro-reading classroom that promotes student autonomy and accountability. While the information gathered will be useful to the teacher in crafting future instruction, the assessment also helps set the stage for the student. It begins to orient them towards important ideas around reading, for example, confronting challenging words, self-evaluating comprehension, and thinking about the social and emotional aspects of their lives as readers. In this way, the assessment addresses what James Paul Gee in his book What Video Games Have to Teach us about Learning and Literacy (2003) terms the external grammar of reading. 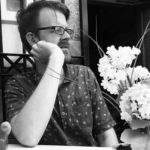 While the reading lab assessment looks at the internal grammar of reading (how well the student performs the acts of decoding and comprehension), the How I Feel about Reading assessment considers the external grammar of reading, how readers think and live and how the students can construct their own lives as readers. In this way, the assessment provides far more information than a benchmark assessment, using decidedly fewer hours of the teacher’s time. The assessment allows the teacher to collect data essential for helping the students reading growth in a way that is not overly taxing for the student or the teacher. Additionally, the personalization of the assessment allows students to play an active role in their assessment as readers, promoting autonomy and accountability. Facilitates the development of self-assessment (reflection) in learning: This is achieved through the How I Feel about Reading assessment. Students are encouraged to reflect on their own feelings and habits as readers and are required to articulate their own personal reading goals. Delivers high quality information to students about their learning: The assessment is founded on sound principles for assessing decoding, comprehension, and students background in reading. Encourages teacher and peer dialogue around learning: The ability to share and present the Google slides provides many opportunities for dialog between teachers, students, and families. The data from the Reading Lab can be used to help teachers create ability-based peer groups that ensure students are working to the best of their ability in groups of students who are confronting the same challenges. Encourages positive motivational beliefs and self-esteem: The assessments are fun, non-judgemental, and personalized. They should make students feel comfortable. Provides opportunities to close the gap between the learning goal and the students’ current performance: The flexibility built into the Reading Lab, means that students can grow with the assessment over time. The saved Google Slides allow student to revisit and revise their thinking about assessment. Help students set reading goals both in terms of the development of decoding and comprehension skills, as well as the quantity and variety of reading that they do. The two videos below will give you an overview of the two assessments. The first video is a virtual tour of the Reading Lab and the second is the introduction to the How I Feel About Reading Assessment. If you would like to try out the assessments links are provided below. Note: the Reading Lab is a download application that is compatible with Mac, Windows, and Linux. Feel free to download the appropriate file. Gee, J. P. (2003). What video games have to teach us about learning and literacy. New York, NY: Palgrave Macmillan. The images used in the application are cited in the resources link in the application. You can view it here.